Horus is a boy that one day, hunted by silver wolves, found the sword of the sun. The day his father died he left his home to find the people from the town his father told him. Together with a small bear named Koro he starts the journey an runs into a great adventure fighting against Grunwald and his subordinates who want to rule the world. Imagine the King Arthur origin tale mixed with vague Beowulf elements, then filter that through Kurosawa-esque scenery, directing, and atmosphere, and Hols: Prince of the Sun is approximately what the result might end up like. Although still owing to its Western influences a great deal, Hols: Prince of the Sun marks the beginning of a divergence from Western formulas and animation traditions though its embrace of comparatively Eastern themes and presentation, particularly in its cinematic formalism. While the level of detail may not be up to most expectations of the casual anime viewer, it should be noted that it more than makes up for this with its smoothness and frame rate. The opening sequence alone will have any audience hooked as Horus beats off a pack of wolves—and is shot so as to be easily one of the most memorable opening sequences ever filmed. This impeccable level of quality is maintained throughout the film with only a few exceptions. The theme music is memorable, though the rest of the soundtrack is rather forgettable and fairly typical of its time period. It nonetheless suits the visuals it accompanies, regardless of its dated nature. The few "musical numbers" that peek up are used as plot advancements and tone-setters rather than merely to spotlight frivolous musical interludes--and several of them are used to highlight character development. Which brings me to the characters, who--while perhaps two-dimensional--are solidly written and developed within the context of their narrative purpose. Superficially, it isn’t hard to draw comparisons to the Golden Age of Disney animation; the smoothness and overall quality of the animation is spot-on, and the character models, settings, and color pallet are all reminiscent of Disney’s from the same time period. But that’s where the comparisons end; although the story takes place in a Nordic-like environment in the West, the story remains centered around themes concerning death and vengeance, communal acceptance, and rejection that are largely developed through methods that owe more to Akira Kurosawa than to Walt Disney—specifically the overtly dark atmosphere that hangs about the whole work, and the general level of grimness present throughout the tale. 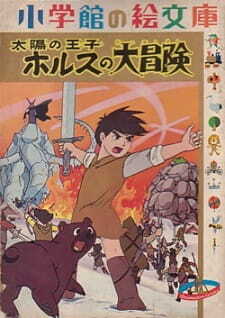 Hols: Prince of the Sun is a landmark for Japanese animation. It is perhaps best enjoyed by the audience it was intended for, as many contemporary anime fans will probably be turned off by its superficial resemblances to simpler animation, its dated quality, or the fact that it was produced as a children’s story. However, this should not dissuade any fans of older animation or animation in general, as it stands on its own as a great story with interesting visuals regardless. I saw this movie on a whim while I was looking for episodes of the live-action TV show &quot;Firefly&quot;, which I've been meaning to watch for years, and was pleasantly surprised. Horus/Hols:Prince of the Sun (localized under several other titles in other countries) has an amazing pedigree-directed by Isao Takahata , animation credits by the famous Hayao Miyazaki, among other famous names in Japanese animation, and is considered to be the first modern anime film, as it broke away from the typical Disney movie fare that they saw in anime. That being said, the movie still looks, feels, and sounds like Disney animated classic, which is not a bad thing at all. While it's obviously a children's movie, it doesn't pull too many punches. While both Hols and Arthur from the Disney movie &quot;The Sword in the Stone&quot; get their magic weapons in the same way, Prince of the Sun isn't all kids' stuff. The opening sequence is actually a pretty taut action sequence: Hols, the courageous Norse hero, defends himself from a pack of evil wolves with an axe on a rope. It's very well-choreographed and animated, but doesn't manage to be too violent, or gruesome in any way. Not only that, but the antagonist, Grunwald, wants to rule the world by killing off the human race, which has been forced into a tiny fishing village on a northern fjord. Some of the themes of the movie, like Socialism and xenophobia might be lost on children too. Another Disney-like quality of Prince of the Sun is the music, it's damned great. The soundtrack has a beautiful and rousing score, and most of the background music follows the motif of the awesome main theme, which basically sings about how awesome Horus is. There's some more singing later on in the movie, but it's not obtrusive and fits the scenes rather well. You won't have to worry about a spontaneous dance number, but the singing that's there is rather beautiful, if mournful at times. And like any good Disney film, the movie looks gorgeous. While they don't have the same detail as say, a modern Chibli movie, they're still very pretty, and make the movie even more worthwhile. According to the wikipedia, it was behind schedule, and over 30 minute of film had to be cut, and replaced with still images. It's a bit jarring to go from fluid-looking movement to still frames, but it doesn't happen too often, and the rest of the visuals make up for it. The characters have this soft, rounded look to them, but that doesn't make Horus look any less the hero, and some of the enemies he faces, like a giant fish monster with a death beam would probably be nightmare fuel for a little kid. Speaking of Horus, he makes the movie. He has the qualities of any good shonen hero, but with more resolve, and less stupidity. I'd say that even if you're not a fan of older anime, you'll be enchanted by Prince of the Sun. It made me feel all fuzzy and nostalgic inside, and I can easily see my younger self falling in love with it, and scrambling over the couches with a toy axe to imitate Horus' heroics. If I'm ever dumb enough to have children, I'll be certain to show them this film. It's a piece of anime history, and a great one at that. I totally recommend it. Technically this film is leagues away from the quality of films later produced by Takahata and Miyazaki at Studio Ghibli. Still it's a great little film with more depth than is first apparent. It's a shame Takahata encountered such resistance and lack of backing from the studio when making this film. It could have been so much more. At one point still frames replace the animation becuase they ran over budget in production! A landmark in anime nontheless. Well, this is a really really old video and let’s say that for its time, it might have been very high class but now, it feels like it lacks a lot. The animation is low quality and the voices feel forced and scripted. Horus seems to not think about what he is about to do, his heart being in the right place but his head just doesn’t seem to be happening there. He was made to be the purest of the pure but they made him come out as a rather young child, younger then he should be. Other characters randomly sing and makes it feel like we are in a old Disney movie. The animation is really old and they cut corners constantly. They reuse clips a lot and also jump around without any explanation on why they are except that they are travelling. Both people and animals look rather blotchy and not a lot of detail. In order to not animate some of the faces, they are covered in thick bushes of hair from eyebrows and beards. The script sounds cheesy in the English version, where the voice actors feel as though they are just reading lines. It’s rather narrative and descriptive in the beginning and then loses a lot of that as the story goes on, not explaining enough when it needs to later on. It feels like it should have been much shorter. They did do a good job matching the voices though so it does get some props for that.